Why a Modular Pack System? 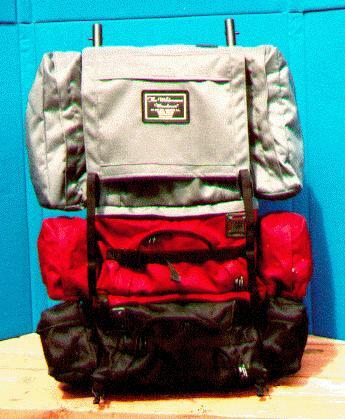 No two backpack trips are alike, therefore, your pack requirements will vary. I developed the concept of a modular backpack system from first hand experience in the mountains of the Canadian Northwest. I required a full frame pack that would be tough, yet comfortable fully loaded, to carry my camp into the mountains. Once my camp was set up, my pack requirements changed. If I wanted to go hunting for the day, I would need a medium size Internal Pack. This pack compresses down quite small and isn't cumbersome when empty, yet has a full harness and the capacity to bring back a good size load. For spending the day hiking or taking pictures, all I needed was a Day Pack for carrying my camera equipment, lunch and rain gear. To go on an afternoon jaunt all I would require is a Fanny Pack. For carrying my spotting scope and camera on an evening check about camp, all I would require is a couple of side pockets (off of the pack) which attach directly to my belt. The Wilderness Wanderer gives me the versatility I need, all in 1 pack, whether I go on an overnight side trip or a three week pack trip through the mountains.